Heisenberg-Gruppe "Distributionelle Modellierung von semantischen Beziehungen"
Die Heisenberg-Gruppe war eine unabhängige Arbeitsgruppe unter der Leitung von PD Dr. Sabine Schulte im Walde. Die Förderung erfolgte durch die Deutsche Forschungsgemeinschaft (DFG) mittels einer Kombination von Heisenberg-Stipendium und Sachbeihilfe, und wurde außerdem durch das Integrierte Graduiertenkolleg des SFB 732 unterstützt. Die Gruppe existierte von November 2011 bis Februar 2017. Unser Vorhaben hat semantische Beziehungen zwischen Wortbedeutungen innerhalb eines interdisziplinären distributionellen Ansatzes modelliert. Dabei nutzten wir eine interdisziplinäre Verknüpfung der theoretischen Linguistik als Ausgangspunkt für empirisch plausible Worteigenschaften und die Definition von Goldstandards; Methoden der kognitiven Linguistik um zu erforschen, wie Menschen semantische Wortbeziehungen wahrnehmen und ausdrücken, und computationelle Methoden, um plausible Ansätze für die Modellierung von Wortbedeutungen zu definieren sowie das semantische Wissen in maschineller Übersetzung einzusetzen. The overall goal of the SemRel group was to explore the potential and the limits of distributional approaches to lexical semantics. In phase 1 of the project (11/2011-01/2015), we distinguished three types of semantic relatedness, to shed light on distributional modelling from different perspectives. The work was performed within an interdisciplinary framework between theoretical, cognitive and computational linguistics. The following figure illustrates the interaction of our topics. 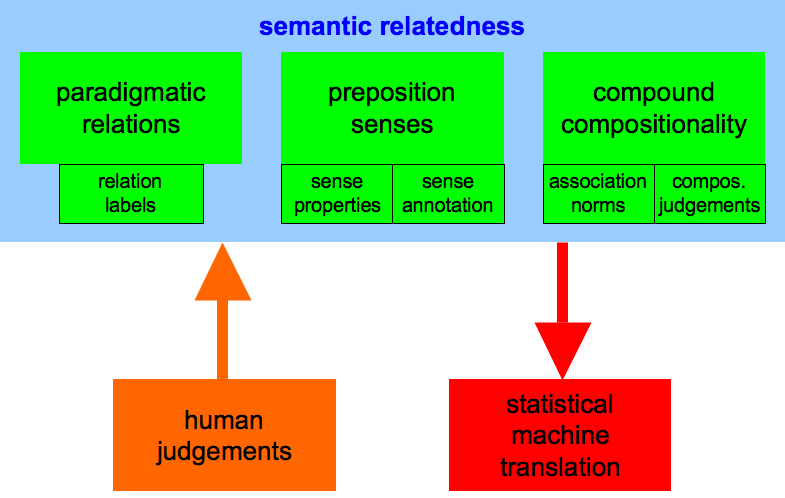 Each type of relatedness concerning paradigmatic relations, preposition senses and compound compositionality received input and feedback from human judgements, and was applied to statistical machine translation. While SemRel phase 1 distinguished three types of semantic relatedness, phase 2 (02/2015-01/2017) aimed to bring together the tasks, approaches and results from these test cases, to study semantic relatedness from a meta-level perspective: We (i) investigated distributional approaches across types of semantic relatedness, across word classes, and across languages; (ii) explored the linguistic performance of soft clustering approaches, parameters, and evaluations to model ambiguity; and (iii) abstracted over semantic subcategorisation information and semantic evaluation for SMT as an extrinsic application. 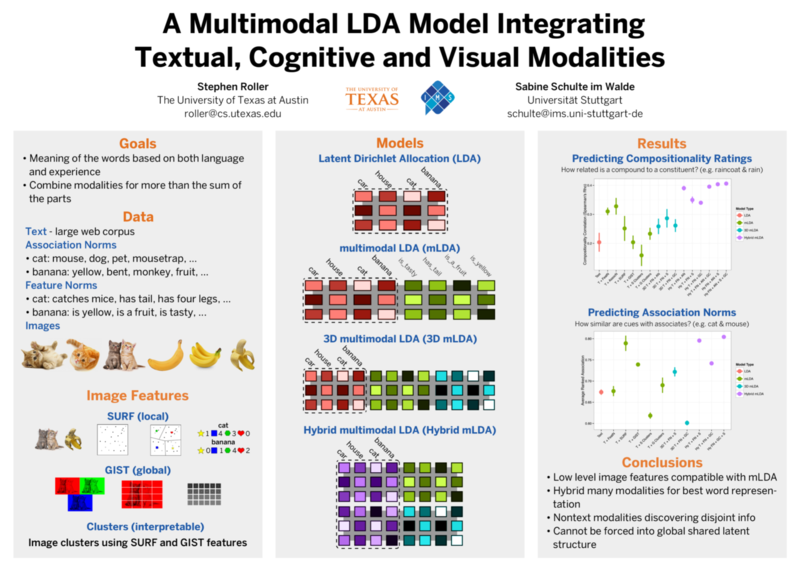 Overall, the work continued within an interdisciplinary framework between theoretical, cognitive and computational linguistics, which allowed us to explore distributional approaches through complementary evidence. Interdisciplinarity: Theoretical linguistics provides the formal definitions of the semantic relatedness phenomena we are interested in, and cognitive linguistics tells us how humans perceive and express semantic relatedness. Both from the linguistic and the cognitive perspective, we expect a guidance towards selecting and implementing theoretically and cognitively adequate distributional attributes to model word meaning, and gold standards as seeds for computational algorithms and for intrinsic evaluations of the distributional models. As regards the cognitive perspective, we do not only expect cognitive evidence for the potential of distributional knowledge, but also clear evidence for its limits, as human judgements naturally comprise both distributional and world knowledge. Altogether, linguistic and cognitive feedback should help us to define simple, straightforward computational methods to assess information about distributional meaning. Furthermore, the computational perspective explores the applicability of our distributional semantic knowledge to statistical machine translation as an extrinsic evaluation. Challenges: Within our interdisciplinary approach, we address two major challenges. Firstly, we are interested in a theoretically and cognitively adequate selection of features to model word meaning and word relatedness. In this respect, our project differs from approaches that are not interested in the actual meaning of their features but only in optimising a complex computational machinery that makes use of them. In contrast, our goal is to explore the meaning and the potential of comparatively simple distributional models. Secondly, our work aims to model word meaning with respect to word senses, thus addressing ambiguity. Even though ambiguity is a frequent target of computational models in general, it has largely been ignored in distributionality. Journal of Language Modelling 6(1):41-86. In: Proceedings of the 16th Annual Conference of the North American Chapter of the Association for Computational Linguistics: Human Language Technologies (NAACL-HLT). New Orleans, LA, June 2018. In: Wortschätze: Dynamik, Muster, Komplexität, Jahrbuch des Instituts für Deutsche Sprache 2017. Berlin / Boston: De Gruyter. In: Proceedings of the 13th Workshop on Multi-Word Expressions. Valencia, Spain. In: Proceedings of the Conference on Empirical Methods in Natural Language Processing (EMNLP). Copenhagen, Denmark, September 2017. In: Proceedings of the 15th Conference of the European Chapter of the Association for Computational Linguistics (EACL). Valencia, Spain. In: Proceedings of the 12th International Conference on Computational Semantics (IWCS). Montpellier, France, September 2017. In: Proceedings of the 5th Workshop on Cognitive Aspects of the Lexicon (CogALex). Osaka, Japan, December 2016. In: Proceedings of the 54th Annual Meeting of the Association for Computational Linguistics (ACL). Berlin, Germany, August 2016. In: Proceedings of the 10th Conference on Language Resources and Evaluation (LREC). Portoroz, Slovenia, May 2016. In: Proceedings of the 26th International Conference on Computational Linguistics (COLING). Osaka, Japan, December 2016. To appear. In: Proceedings of the 5th Joint Conference on Lexical and Computational Semantics (*SEM). Berlin, Germany, August 2016. In: Proceedings of the 1st Conference on Machine Translation (WMT). Berlin, Germany, August 2016. In: Proceedings of the 12th Workshop on Multiword Expressions. Berlin, Germany, August 2016. In: Proceedings of the 11th Conference on Computational Semantics (IWCS). London, UK, April 2015. In: Proceedings of the 11th Workshop on Multiword Expressions. Denver, CO, June 2015. In: Proceedings of the 26th International Conference of the German Society for Computational Linguistics and Language Technology (GSCL). Duisburg-Essen, Germany, September 2015. In: Proceedings of the 18th Annual Conference of the European Association for Machine Translation (EAMT). Antalya, Turkey, May 2015. In: Proceedings of the 9th Workshop on Syntax, Semantics and Structure in Statistical Translation (SSST). Denver, CO, June 2015. In: Proceedings of the 9th Conference on Language Resources and Evaluation (LREC). Reykjavik, Iceland, May 2014. In: Proceedings of the 3rd Joint Conference on Lexical and Computational Semantics (*SEM). Dublin, Ireland, August 2014. In: Proceedings of the 1st Workshop on Computational Approaches to Compound Analysis. Dublin, Ireland, August 2014. In: Proceedings of the 4th Workshop on Cognitive Aspects of the Lexicon (CogALex). Dublin, Ireland, August 2014. In: Proceedings of the 10th Workshop on Multiword Expressions. Gothenburg, Sweden, April 2014. In: Proceedings of the 52nd Annual Meeting of the Association for Computational Linguistics (ACL). Baltimore, MD, June 2014. In: Proceedings of the 14th Conference of the European Chapter of the Association for Computational Linguistics (EACL). Gothenburg, Sweden, April 2014. In: Proceedings of the COLING Workshop on Lexical and Grammatical Resources for Language Processing. Dublin, Ireland, August 2014. In: Proceedings of the Seventeenth Annual Conference of the European Association for Machine Translation (EAMT). Dubrovnik, Croatia, June 2014. In: Proceedings of the 11th Conference of the Association for Machine Translation in the Americas (AMTA). Vancouver, Canada, October 2014. In: Proceedings of the Conference on Empirical Methods in Natural Language Processing (EMNLP). Seattle, WA, October 2013. In: Proceedings of the 9th Workshop on Multiword Expressions. Atlanta, GA, June 2013. In: Proceedings of the 6th International Joint Conference on Natural Language Processing (IJCNLP). Nagoya, Japan, October 2013. In: Proceedings of the 8th Web as Corpus Workshop. Lancaster, UK, July 2013. In: Proceedings of the 25th International Conference of the German Society for Computational Linguistics and Language Technology (GSCL). Darmstadt, Germany, September 2013. Journal for Language Technology and Computational Linguistics 28(2):85-105, 2013. Special Issue on Web Corpora for Computational Linguistics and Linguistic Research, edited by Roman Schneider, Angelika Storrer and Alexander Mehler. In: Proceedings of the 2nd Joint Conference on Lexical and Computational Semantics (*SEM). Atlanta, GA, June 2013. In: Proceedings of the 10th International Conference on Computational Semantics (IWCS). Potsdam, Germany, March 2013. In: Proceedings of the 51st Annual Meeting of the Association for Computational Linguistics (ACL). Sofia, Bulgaria, August 2013. In: Proceedings of the 8th International Conference on Language Resources and Evaluation (LREC). Istanbul, Turkey, May 2012.